Americans are gripping their wallets with tight fists as they wade out the current recession. But Americans aren’t just concerned about saving money. American adults have to work as many hours as possible to pay the bills and afford the necessities, so time is more valuable than ever. Leisure time is particularly precious during such a stressful time, so people do not want to spend it running errands in all sorts of different stores. Not only do these stores lure penny pinching Americans with their lower prices, but they also have the “one-stop-shop” appeal – you can get your groceries, your clothes, and your school supplies all in one place. And Wal-Mart is about to become even more enticing as the Food Institute confirms that the corporation’s COO, Bill Simon, is making significant price cuts to merchandise. Wal-Mart has honed in on this lethal combo of saving time and money in their advertising techniques. 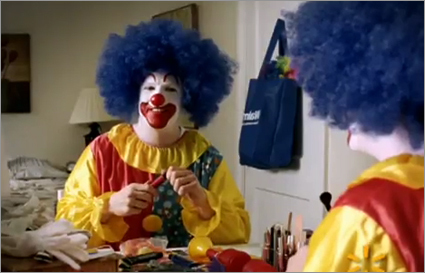 Check out this recent television commercial that features a mom boasting about how she got food and all other party essentials at Wal-Mart (WARNING: May disturb those with clown phobias). 1 comment to Food: Wal-Mart For Dinner! It makes me sad to see Walmart dominating so many industries, including food. I understand its appeal with cheap prices and one-stop-shop convenience. But at the same time, it kills small business, and encourages complete monopolization. But I can’t hate it too much. I try and support small business as much as I can, especially food-related. But as a college student, the lower prices Walmart offers help me to save money and live comfortably on a college budget.